A great board-staff relationship is key to a thriving ministry. 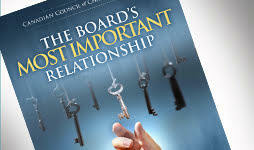 In this course, author John Pellowe, CEO of CCCC, walks through the components of a healthy relationship between boards and their senior leaders. You’ll be provided with practical ways to support each role, resolve conflict, conduct leadership reviews, and end the relationship well. This course uses a variety of video, audio, and written materials. 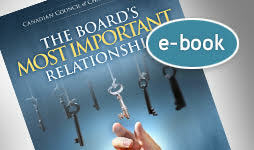 The textbook for this course, The Board’s Most Important Relationship, features discussion guides and perspectives from six consultants and practitioners. The e-book is available here, and the paperback is available here . The course adds insights and application activities to the textbook material. Together, the book and course form a comprehensive board development resource to help directors and senior leaders forge a great working relationship for the sake of their ministry and the cause of Christ. Excluding the assignments and activities, the entire course will take approximately 2.5 hours to complete. To help you plan your time, each module shows an estimate of time required for completion. Develop policies and practices that support the senior staff leader’s personal and professional growth, enable the senior staff leader to do his or her job, and create a relationship that will maximize the probability of organizational health and mission success. Appraise the senior staff leader’s performance formally and informally using processes that respect Christian theology and the leader, while addressing three categories of performance indicators. 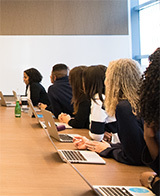 Analyze the quality of the board-senior staff leader relationship against four common harmful senior staff leader behaviours and take corrective action as required. Design a plan to end the relationship well under five possible scenarios. Adopt behaviours that will earn the board’s trust. Provide organizational leadership, while at the same time serve under the board’s leadership. Support the board’s work and contribute to the development of its governance skills. Define the theological principles that set the standard for the board-senior staff leader relationship. Design action plans to apply theological principles and improve the board-senior staff leader relationship.